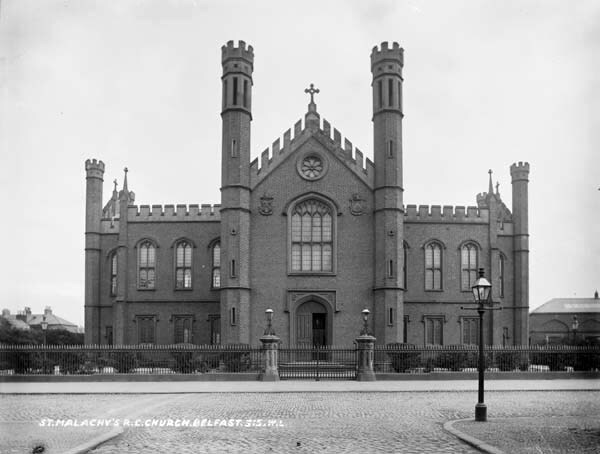 Originally Saint Malachy’s was intended to be the Cathedral Church of the Diocese of Down and Connor and was to seat 7,000 worshippers but in the time when the Great Famine took hold in Ireland it was decided that the funds would be better spent elsewhere to alleviate the suffering of many. What was intended to be the vast sanctuary of the new Cathedral was remodelled to serve as the local Church. Designed by Thomas Jackson and it is in the ecclesiastical style of the Tudor period. Described by Sir Charles Brett, as “a superb example of Sir-Walter-Scottery at its most romantic”. It is cruciform in shape, 113 feet wide, 52 feet wide and 40 feet high. 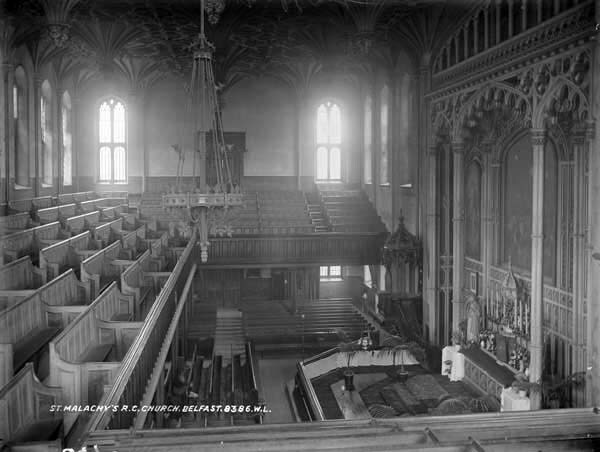 The original High Altar, Pulpit and Altar Rails were of Irish Oak however they were replaced with marble when the Church was renovated in 1926. The altar piece is placed centrally on the long wall. A large raked gallery occupies the other three walls. All that remains of the original ornaments is the canopy over the pulpit which has been painted white to match the marble of the present altar furnishings.